So, while the rest of the gang are doing the Intrepid that I did a couple of weeks ago, I decided to take the laptop for a walk to get some work done here. No. I mean, literally. Here. In Times Square. Smack in the middle of what used to be Broadway. On the lawn chairs in front of the ESPNZone, with their free wifi (Thanks!). With the tourists. Fake pedestrian malls with red pavement and oases of gravelly walkways with red chairs and tables. Spongebob, Dora and Elmo, scamming tourists for pictures. Please tell me someone's getting licensing money for that. Sidewalk vendors with easily cartable food or funny drawings for sale. Giant signs with lots of moving lights. Screaming kids in double-wide strollers, being pushed by frustrated parents. Cameras are ubiquitous, with people getting pushed out of the way to get that Kodak moment. Actually, the only thing we're really missing in Times Square are rides. But hell, take a cab to get here. That'll complete the experience. Found it. 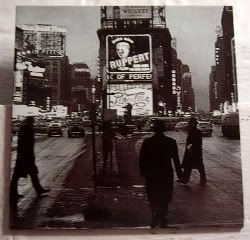 According to Gothamist, this magnet image is Rudy Burckhardt's Times Square at Dusk in 1947. I'm sad I missed the Glitz & Grime photography exhibition at the Yancy Richardson Gallery that ended just last month. Seems like for every cool thing I know to do in the city, there's always a few more that I end up missing, too. Sigh. Isn't that always the way?